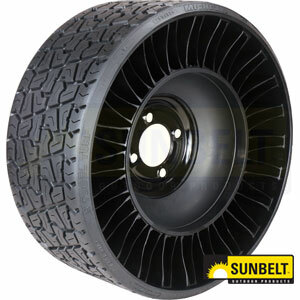 The MICHELIN® X® TWEEL® TURF airless radial tire is designed to help zero turn radius mowers achieve excellent cutting results and outstanding rider comfort, while eliminating downtime caused by flat tires and unseated beads. The MICHELIN® X® TWEEL® TURF Caster replaces the current front tire/wheel assembly on zero turn radius mowers, and offers the same trouble-free benefits. 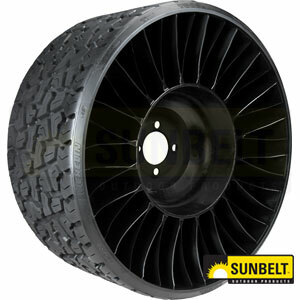 The MICHELIN® X® TWEEL® TURF airless radial tire is one single unit, replacing the current tire/wheel/valve assembly. Once they are bolted on, there is no air pressure to maintain, and the common problems of unseated beads and flat tires are completely eliminated. The MICHELIN® X® TWEEL® TURF airless radial tire has a consistent hub height which helps ensure the mower deck produces an even cut. The full-width poly-resin spokes provide excellent lateral stability for outstanding side hill performance, while the unique design of the spokes helps dampen the ride for enhanced operator comfort, even when navigating over curbs and other bumps. 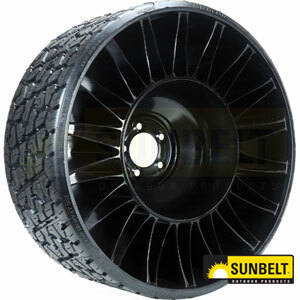 High performance compounds and an efficient contact patch are designed to provide a long wear life that is two to three times that of a pneumatic tire at equal tread depth. The MICHELIN® X® TWEEL® TURF product is designed to perform like a pneumatic tire, but without the risk and costly downtime associated with flat tires and unseated beads. Michelin’s proprietary Comp10 Cable™ forms a semi-rigid “shear beam”, and allows the load to hang from the top. 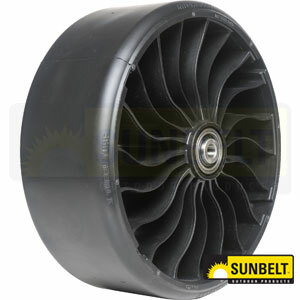 High strength, poly-resin spokes carry the load and absorb impacts, help dampen the ride, and provide a unique energy transfer that reduces pneumatic bounce. 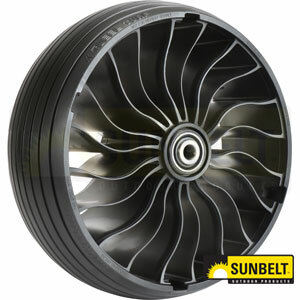 Heavy gauge steel hub designed to fit on a variety of popular mowers. Multi-directional tread pattern is optimized to help provide excellent side hill stability and prevent turf damage. Zero degree belts and ComposiCoil™ proprietary design provide great lateral stiffness, while resisting damage and absorbing impacts. B122628TWC: 13x6.5N6 CASTER 5/8" I.D. B152441TWC: 13x6.5N6 CASTER 3/4" I.D. B149976TWC: 13x6.5N6 CASTER 5/8" I.D. B105768TWC: 13x6.5N6 CASTER 3/4" I.D.